Ed Shenk has fished since the age of two or thereabouts; caught his first trout at the age of seven. Ed has fished the LeTort ever since. Ed has also fished the West, including Wyoming, Montana, and Idaho for the past 36 years (22 trips) as well as streams in New Jersey, New York, Kentucky, Tennessee, North Carolina and South Dakota. Ed has fished the famous streams of Argentina four times, staying and fishing with world famous Bebe Anchorena of Buenos Aires. Argentine streams fished were Chimehuin, Malleo, Caleufu, Quilquihue, Traful and the Alumine. Ed Shenk has been fishing for 80 years and has tied flies for 65 of those years. His homewater is the LeTort River where he developed and tested the LeTort Cricket, Flat Wing LeTort Hopper, Shenk Cress Bug, and Shenk Sculpin. He's a master of fly fishing terrestrials so be sure to listen in and take adavantage of a lifetime of experience. His best Argentine trout was a 29-inch, 9-pound Brown from the famous Boca pool of the Chimehuin. Also, the Traful yielded a 9-pound landlocked Salmon to Ed in 1989. Both fish were taken on a Shenk Sculpin. Another Traful Salmon of 8 pounds was taken on the White Minnow. Ed has tied flies for 65 years, tying commercially for most of that time. He has originated the LeTort Cricket, Flat Wing LeTort Hopper, Shenk Cress Bug, Shenk Sculpin, popularizing the dubbing loop or fur chenille method. He was the first to trim these fur loop tied flies to specific shapes such as the flat oval of the Shenk Cress Bug. Note the late Jack Schneider of Montana first described the fur loop, but Ed originated the "trim to shape". He also originated the Shenk Minnow and the "double trico". Ed was the first Co-President (with Jim Bashline) of the Cumberland Valley Chapter of Trout Unlimited and the first recipient of the Limestoner Award. Also, recipient of the Charles Fox "Rising Trout" Award, George Harvey Award, and Order of the Hat (Harrisburg Fly Fishers). 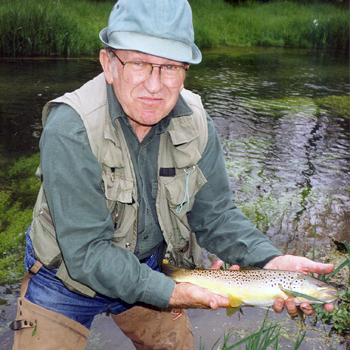 Fishing Instructor for Allenberry Inc. (1987-2002), LeTort Limited (1978-1986), Orvis Allenberry Fly Fishing Schools (1965-1977), and was the Fishing Instructor under Joe Humphreys at PENN STATE, July 1987, '88, '89, '90. Ed has fished with various dignitaries including William Conrad, Gov. Ray Shafer (PA) and tied flies for President Jimmy Carter. He also fished with the late Joe Brooks. Ed has written over 50 articles for the following magazines: Sports Afield, Field and Stream, Fly Fisherman, Flyfisher, Trout, Pennsylvania Angler, Fly Fishing Heritage, Fly Rod and Reel, American Angler, American Fly Tyer and the Mid Atlantic Fly Fishing Guide. Ed published the book Fly Rod Trouting in 1989, which was released as a hardback edition and later as a paperback. He also released a VHS video in 2000: Ed Shenk, Master of the LeTort. This video shows tying and fishing five of his patterns - Shenk Sculpin, Shenk Minnow, Shenk Cress Bug, LeTort Cricket and Shenk LeTort Hopper. Both book and video are out of print.